2 bedroom / 2 bath top-floor condominium in a lovely 2-unit building, built in 1991. For more photos & information click here! 1 bedroom / 1 bath condo in the heart of it all! Location, location, location! Bright 1 BD/1BA condo in a classic 4 unit building on a quiet alley in the heart of the action. The open floorplan lets light in from front to back. Enter into your spacious living room which opens to the large eat-in kitchen with a breakfast bar. The kitchen boasts stainless steel appliances, custom cabinetry, and Caesarstone countertops. The luxurious bathroom has a shower over tub & custom built vanity for storage. Bedroom has 2 large, fully customized closets. Hardwood floors, recessed lighting, and extra insulation for noise protection. Laundry room off of kitchen has stackable W/D enclosed in custom cabinetry and leads to the exclusive use backyard w/ patio. 1 independent parking space in garage. HOAs: $150/mo. It doesn't get better than this! Walk score 94. 2 bedroom / 2 bath condo in detached rear building off the street! 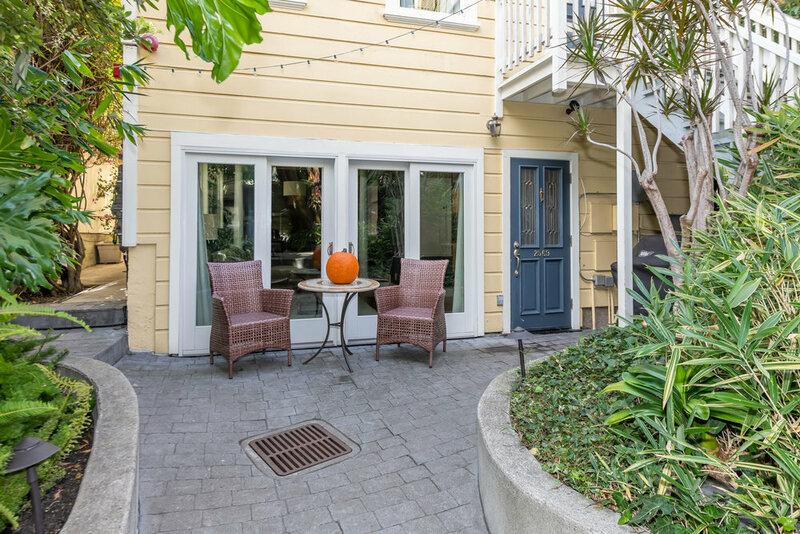 Backed away from the street in Lower Pacific Heights you'll find this secluded townhouse style condominium in a detached rear building. Enter through the garden oasis to an exclusive use patio and entry to the unit. Beautiful Edwardian details abound throughout including crown moldings, high ceilings and an original, refinished clawfoot tub. The lower level has an open floor plan with an updated kitchen that opens through a breakfast bar to the dining room. Large sliding doors in the living room open to the garden & exclusive use patio. Upstairs are two spacious & light bedrooms and two full bathrooms, including an updated en-suite master bath. Master suite has sliding doors which open to the exclusive use south facing deck and shared terraced planting beds. Laundry, storage, and parking in garage.